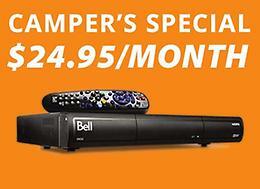 CAMPER'S SPECIAL Satellite TV from Bell starting at $24.95/month! Free Crave + HBO for 2 months! PLUS get the first HD PVR for FREE! Includes Basic Essential Channels! NO TERM REQUIRED. Click HERE to find out more or call us at Micro-Tech 709-368-6008. Mint condition, very little use, estimate of 10 hours of use. Selling because of health issues, Paid 2700. Asking 850. Toshiba DVD player. Missing remote. Brand new still in the box. Never got around to installing it. Four 235 65 17 Bridgestone Blizzak winter tires. Two tires have 75% tread remaining and two have 50% tread left. No plugs or damage. Ford Fiesta bug deflector in very good condition. Call or text 728 3566. A set of table lamps in like new condition. Hardly used just mostly used for home decor. Asking $50. Call 728-3566. Carbon Fiber Beany motorcycle helmet in excellent condition. Comes in original box with helmet bag. Asking $60. Call 728-3566. SERIOUS GROWTH by Optimum Training Systems is full of strategies for bodybuilding. Detailed training programs and principles of weight training, recovery, diet and nutrition.